Dental amalgam mercury removal from teeth with extreme cautions to protect the patient, staffs and the environment. We individualize protocol for each patient based on his or her special medical and dental needs. Special intravenous infusions, including multi-vitamines and anti-oxidants. Bio-compability of dental filler materials by proper serological testing for environmentally and immunologically susceptible patients. Non-metal restorations, including crowns, bridges (short span), laminates (porcelain Veneers) for unattractive teeth or where there are too much spaces amongest teeth. Fabricating bridges with out grinding the adjacent teeth where indicated with out compromising the quality of the final restorations. Improving your smile by replacing the unattractive old dental restorations or mis-shaped teeth. 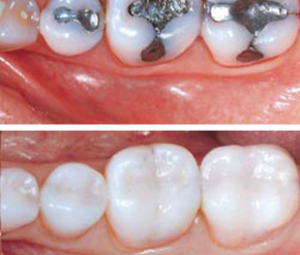 Closures of the front teeth gaps (diastema) with metal free dental materials. Porcelain fused to high noble metals for the long span bridges or when the bite is such which would contra indicates the use of non metal restorations. Full upper and lower dentures with the most biocompatible materials. Partial upper and lower dentures with the most biocompatible materials. We do not do root canal therapy or implant dentistry. Patients interested in these kinds of services will be referred out to the most qualified dentists that would share and understand our philosophy in our approach to the whole patients. Only one of the most expensive and prestigious dental laboratories with an understanding of our office mission and vision will be used. All aspects of jaw bone infection specially if accompanied with manifestation of systemic illnesses are addressed. Removal of non impacted and impacted wisdom teeth with excavation of periodontal ligaments in order to facilitate proper healing and prevent further jaw bone infections. 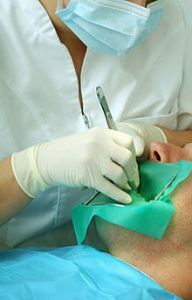 Removal of hard or soft tissue tumors of oral cavity, and peri-oral regions. Removal of infections and osteomyelitis of the jaw bone with the proper closure of the surgical sites to further increase the chance of proper healing. Periodontal surgeries (gum surgeries), tissue grafting, when all conservative means have failed. Intravenous conscious sedation, nitrous oxide sedations (laughing gas) and oral sedation are available up on the patient’s desire e.g. fearful and anxious patients.